BOTH DIVAS IN ONE COMPLETE SHOW! "It was just like singing with the Duchess, you have the voice, the legs, and Tina off to a 'T'! John Miles Tina Turner's MD/ Lead Guitarist. After performing with Paula the same duet Tina and John performed on Tina's 24/7 Tour. "You knocked 'em in the aisles, Paula.. I am full of admiration for the way you took over the room at Wentworth with such great style. A fantastic cabaret". Jerry Stevens. Tournament and Events Director, Variety Club of Great Britain Golfing Society. "The whole show is tremendous your voice (in both Tina and Cher mode) is terrific. Quite how you manage the manifestation between the two ladies so quickly and seamlessly I will never know. Superb! David Harris Chairman. The Variety Club of Great Britain Sunshine Classic. WELCOME TO THE OFFICIAL WEB SITE OF PAULA RANDELL. HERE YOU WILL DISCOVER AN INSIGHT INTO EUROPE'S MOST EXCITING 'HEADLINE' TRIBUTE ENTERTAINER. 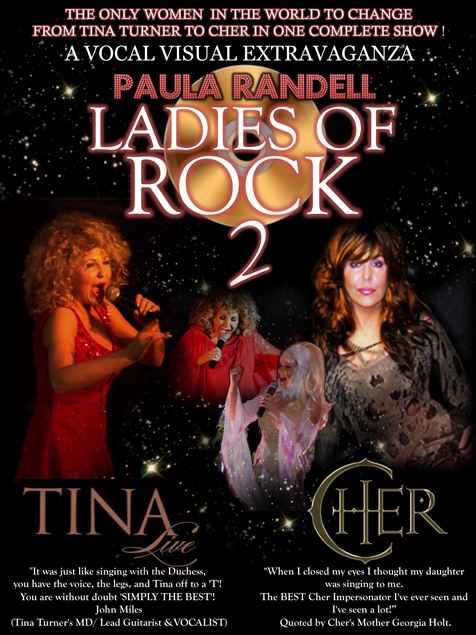 TINA TURNER AND CHER VISUAL VOCAL EXTRAVAGANZA....TINA TO CHER & BACK TO TINA ALMOST BEFORE YOUR EYES! 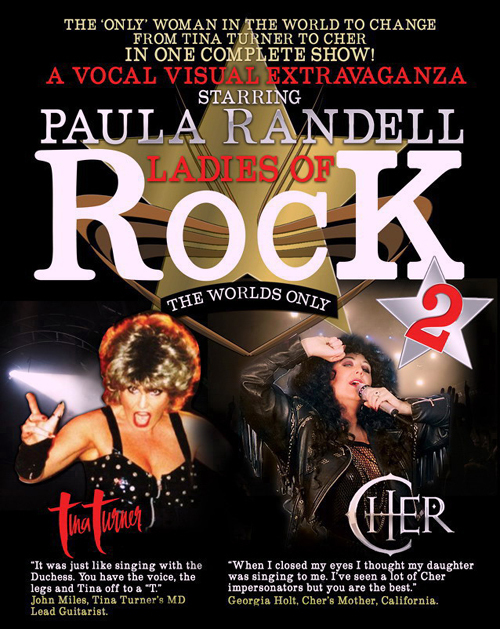 TINA TURNER & CHER * Paula Randell * International Impersonator * Tribute. See Paula as Dame Shirley Bassey!